Yesterday I put up our Christmas tree. This is a sometimes trying business, as the tree must be assembled and the branches spread out from the mashed positions into which they were bent last year when we re-boxed the tree and put it in the attic. Since it’s a tree with lights already installed, one must plug all the connections in correctly, then make certain that all the lights are lit (last year one whole strand went out, which entailed my removing said strand from the tree and replacing it laboriously with another – fortunately, this year everything worked). Then the garlands must go on. This year I had to do the job twice, since the garlands looked so crooked that I pulled everything off and started again. Once the tree is assembled, spread, lit and garlanded, I get out the box of ornaments. I’ve been collecting ornaments for years; since John and I married we have a tradition of buying an annual ornament each year. 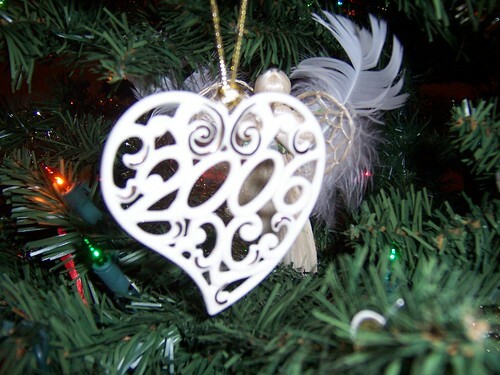 Above is this year’s ornament – a china heart from Lenox. I also have some very old German ornaments that my mother gave me – they are as old as I am and look pretty battered, but onto the tree they must go, if only at the back. This little bird on the left is all that remains of a pretty Partridge in a Pear Tree ornament; it used to sit in a little golden orb with a nest made of some kind of netting. The bird itself had a long spun-glass tail that I loved to play with, but both tail and nest are long gone. I threaded some embroidery floss through the broken beak and the place where the tail used to be, and the bird always sits somewhere high on the tree. 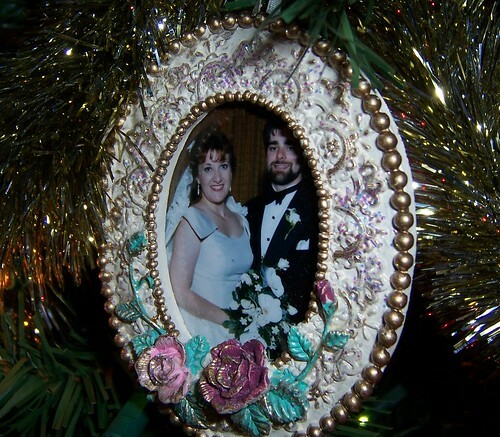 My mother gave us this sweet frame ornament when we were first married, so it was natural that we’d put a wedding photo in it. We’ve been married for thirteen years now, and this ornament always goes in a place of honor at eye level on the very front of the tree. We eschewed the traditional “Our First Year Together” ornament that so many newlyweds get; to me the framed photo says it all. We’re fond of unusual ornaments. This big cobalt moon was given to us by my mother-in-law after I admired it in a shop. I love the size of it (it’s bigger than my hand) and the deep blue color always makes me feel peaceful. Here’s another odd one: I found this glass frog in a nature store and had to have it. I like animal figurals; we have the traditional teddy bears and birds and such, but our collection also boasts a ladybug, an owl, a few dogs and any number of rabbits. 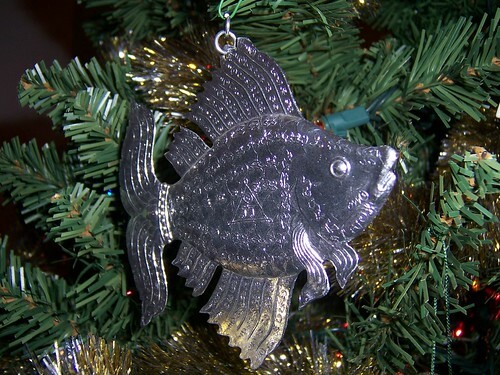 I discovered this great-looking aluminum fish some years ago in a shop that specialized in items from overseas; my mother liked it so much that she got one for herself. Every year I buy John an ornament and put it in his Christmas stocking. He has quite a collection now – a little tin motorcycle and a dirigible, and this tiny glass sledgehammer (below) that I got for him last year. It has special significance because Peter Gabriel’s “Sledgehammer” was “our” song when we were dating (we even had it played at our wedding reception). 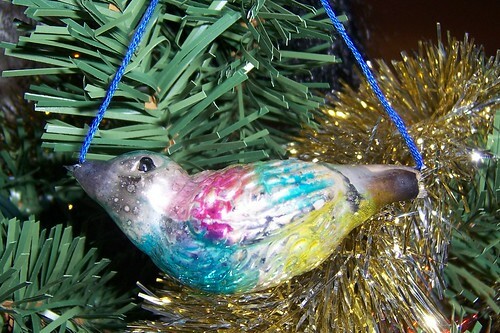 John has bought a few ornaments here and there himself; he got this next one online. 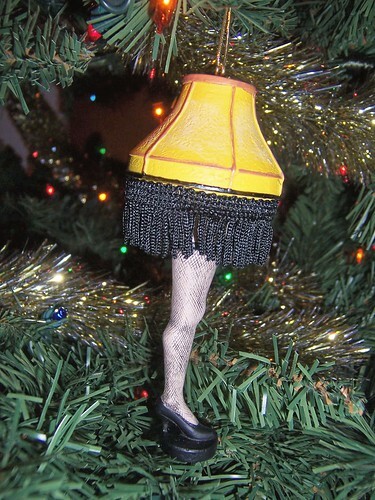 It should be familiar to anyone who’s seen that holiday standard, A Christmas Story (“It’s a Major Award!”). By now you’re probably imagining our tree bent to the ground and groaning with its load of ornaments; I admit that it’s pretty liberally bedecked, but each and every one is important to me. I have ornaments with connections to shows I’ve done (several of them created by the gifted properties designer, Elsie Jones); I’ve got ones given to us by friends and family through the years; I’ve got joke ornaments and serious ornaments, ornaments made of china and crystal and glass and metal, ornaments knitted and woven and crocheted, ornaments painted and decoupaged and bedecked with glitter. 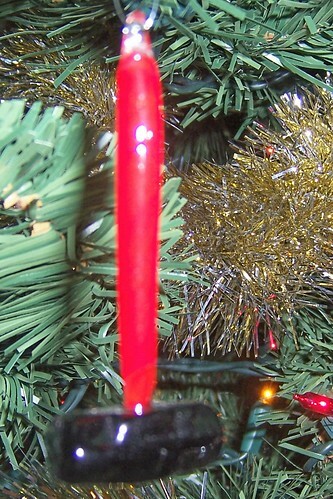 Yes, I probably have too many, so many that some of the “space-filler” ornaments that I bought when I was first starting out – plain colored balls, cheap tinsel stars, plastic elves and Paddington bears – don’t even get onto the tree. Even so, they’ll get used this year. As it turns out, one of the cast members of my current production is having a big Christmas party, and since she’s just starting out, she doesn’t have many Christmas ornaments for her tree. 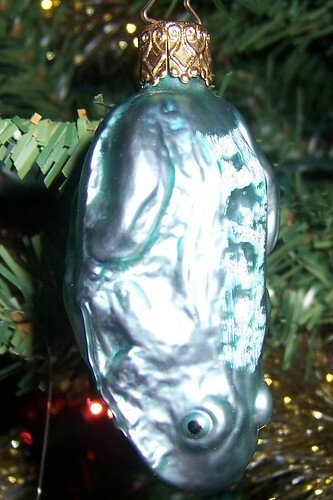 I am pleased to be making her a gift of some of my “starter” ornaments. Maybe years from now, she’ll be unpacking her own collection of holiday decorations and unwrap one of the ornaments I gave her. I hope that it will make her smile to remember when she was young, and bring back happy memories of Christmases Past. Your tree has so much personality! It almost puts me in the mood to start decorating. I do love an eclectic christmas tree – just like mine 🙂 Where on earth did he find the Christmas Story ornament? I want one for a friend who will plotz if I show up at his ornament party with it. Enjoy the season! December 8, 2006 - 3:49 am Joan L.
Mom also has the frog ornament, and every year I momentarily view it from the wrong side and mistake it for a green roasted turkey.Look at it from that side, and tell me if it doesn’t look like one to you too!! 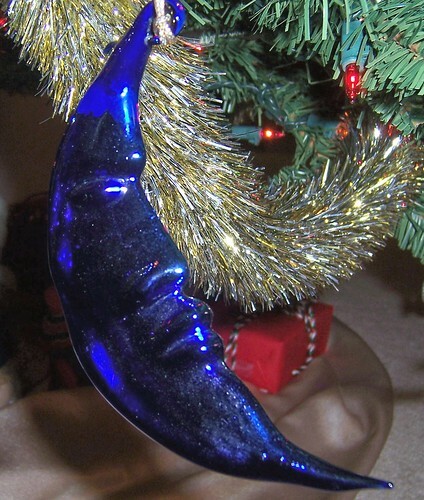 I was searching for a replacement for my colbalt blue moon ornament and came across your site. Would you happen to remember the shop where the moon your Mother-in-law gave you was purchased? It is one of my favorites! Gee – that was a long time ago, but I think she bought it at The Christmas Attic in Old Town Alexandria, VA. I made a quick check for the ornament at their website (http://www.christmasattic.com/index.aspx) and didn’t see it, but you might have better luck calling them to see if they still carry it.Good luck!